I write this in my studio which sits on the top floor of a classic, cast-iron building on West 27th St between 6th Avenue and Broadway. My big picture, like the Big Picture this show seeks to define, is richly visual. The soundscape is complex. There is a loft conversion going on in the building (hey, it’s New York) and the whine of drills and hammering and shouting in Polish carry up from floors below. Somalian umbrella traders down on the street are hawking their wares in the rain. Indian suitcase wholesalers are scurrying in and out of their crowded shops with tarpaulins to cover their wares, and the snap of plastic sheeting in the wind sounds like cracking whips. Police sirens, car alarms, impatient taxis and honking UPS vans punctuate the human noise. My erstwhile neighbours, the musician John Cage and dancer Merce Cunningham, who for years lived together down the road on the corner of 18th St. and 6th Avenue, had a passion for silence. I get this now after a month in New York. The Korean cell-phones, Chinese wigs “made of REAL human hair”, and cloned Vuitton and Gucci handbags arrive downstairs all day and all night in caravanserai laden to the gunnels with stuff. Truck doors slam all day long. 27th St. feels like a cross between Delhi, Mogadishu, Shanghai, Warsaw and Seoul. In other words it feels like New York. The scene is pierced by the oddly fragile needle of the Empire State Building – elegant and as well turned out as a 1930’s Park Avenue lady who lunches. A huge, painted sign on the building between us, mercifully low enough for me to see sky and the top 30-or so floors and spire of the landmark building, is for Hadson Realty, a relic of New York’s City days of expensive real estate. I see people “taking meetings” in offices. I see young, black-clad actors, aspiring heirs to her famous pupils Brando and De Niro, limbering up in the Stella Adler Acting School over the street. I see three young fashion designers crouched over their laptops surrounded by racks of clothes and pedigree dogs (everyone has dogs). I see a brave and thrilling morning glory desperate for light growing up a television cable which dangles perilously in the air. I see many people and many empty buildings around me. New York feels polymorphous, oddly old and anachronistic – like a city that has had its glory days. September 11, 2001 is a scar – a trauma from which the city will take half a century to recover. The collapse of the economy; the greed of the banking world; disappointment in Obama, the oil spill in the Gulf; the perceived failure of the stimulus package; the longest heat wave in New York history; unemployment; the metamorphosis of the city into a shopping mall and the fact that art – one of the city’s greatest contributions to world culture – is no longer made by artists, are all too palpable from where I’m sitting. Like Elvis and Frasier, Bohemia has left the building. Knowing that most of the paintings in this show were made within a mile of MoMA is an amazing thought as I struggle in my noisy studio thirty blocks south of it. This august institution was the Abstract Expressionist’s Shangri La – a magical place where the artists saw their futures enshrined and brought – and bought – into the canon. Many were young veterans of WW II, and as they sat drinking together and chatting in the famously drunken “Club” on 8th St. and in the Cedar Tavern in Greenwich Village, MoMA was a place of dreams. It still is, but for different reasons. This landmark show draws its stock from MoMA’s own vast collection. With over 250 works it is the largest show ever of its kind. In the words of its curator, Ann Temkin, it “shops in its own closet”. 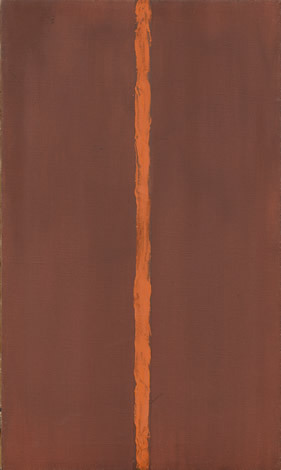 All the big names are there - the gunslingers of abstraction, including rooms of great Jack the Dripper Pollock and smaller, intimate and coherently curated rooms with masterpieces by De Kooning, Gottlieb, Baziotes, Kline, Rothko, Newman, Francis, Motherwell, Guston, Hofmann, Reinhardt, and Still. Even some women (!) such as Grace Hartigan, Lee Krasner (admittedly married to Pollock) and Helen Frankenthaler (admittedly married to Motherwell) and the amazing Joan Mitchell, the elegant Louise Nevelson and the mysterious Hedda Sterne who is new to me, are given major emphasis and they look very, very good. The curators have also accorded space and importance to many lesser known names notably Brooks , Callahan, Leslie, Siskind, Sommer, White and Pousette-Dart. As museum’s director, Glenn Lowry says: “The sum here is so much greater than its parts.” This show comes out of a “realisation that what makes a great period in art history is a collective, not individuals” according to Temkin. 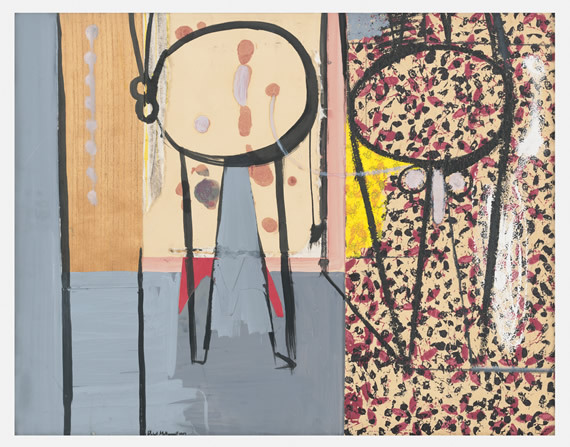 Sixty years have gone by since the high days of Abstract Expressionism, which was the exact time gap between this New York school and the Paris of the Impressionism experiment and collective and its heir – Cubism. The shift from Europe to America is a crucial element in understanding this flowering of artistic energy in New York. Just substitute the name Betty Parsons, the prescient and generous New York gallerist of the Forties and Fifties, who so successfully championed the Abstract Expressionists for Daniel-Henry Kahnweiler, the Parisian Maecenas of the Cubists in the earliest years of the last century and you see the picture, for during and after World War II, Paris, long a centre of the art world and deservedly so, was in a state of political, physical and psychological crisis. There was a seismic shift to the United States and particularly New York City, which became a haven and beacon for many exiled artists and dealers. 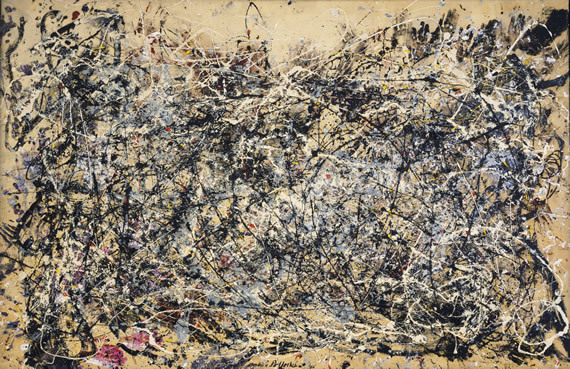 As Pollock said; “It seems to me that the modern painter cannot express this age, the airplane, the atom bomb, the radio, in the old forms of the Renaissance or of any past culture. Each age finds its own techniques.” And “past culture” was European. Notions of beauty; questions about what is a masterpiece; concepts of art- history; political idealism; the tug of war between emotion and intellect; even agitprop – all these ideas bounce manically off the gallery walls in this historic show. 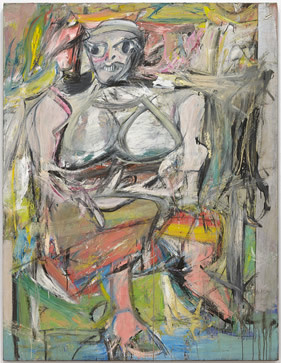 A De Kooning painting A Tree in Naples (1960) in the final gallery just makes you smile with joy as you leave. This show makes this town, and even 6th Avenue and 27th St and Broadway look good.